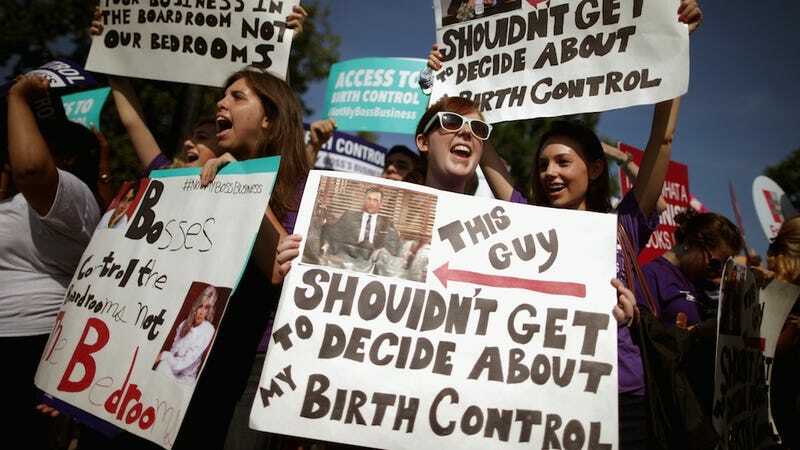 After the Supreme Court's Hobby Lobby decision went down, many women wondered if they would suddenly find themselves at the mercy of their boss's heretofore unknown beliefs that women who take birth control are abortion-happy harlots. Unfortunately, the answer is still yes. Fortunately, thanks to new rules set forth by the White House today, your boss has to inform you if and when this is happening. According to the Department of Labor's website, closely held corporations affected by the Hobby Lobby ruling must inform employees within 60 days if they're planning on opting out of covering any of the 20 methods of contraception originally covered by the Affordable Care Act. One hopes the notification will be slightly more tactful than a sticky note on your computer that reads "Ur a whore! :)," but, you know, these are weird times. Ideally, today's directive will force companies with "religious beliefs" to be straightforward with their employees rather than sneaky about how badly they're hosing everyone. And critics of this directive might wonder what the benefit is. If companies are run by zealots, then what good will telling the employees do? Here's what this "inform your employees of your conscientious objections" mandate will do: it will leave a paper trail that disgruntled employees could easily pass onto media outlets, which media outlets can then convey to the general public. The public can then avoid shopping at places run by people who think that birth control is murder. And now's as good a time as any to say this: if your boss informs you that your birth control is no longer covered because Jesus Loves Zygotes, let us know.